Last month, I described the state of the Jews in Germany during the interwar period (WWI - WWII) and how Hitler came to power and took dictatorial control of the country in 1933. If you missed February's post and would like to read it, here’s the link: "Interwar Germany: Setting the Stage for WWII." Today we will examine how Hitler and the Nazis gradually subjugated their opponents and the Jewish people prior to WWII. In April of 1933, the German government sponsored a two-day boycott of Jewish businesses. Political opponents of the Nazis and all Jews who hadn’t fought in WWI were dismissed from civil service. New laws pushed Jews out of other government jobs, including Jewish doctors who worked in government-financed healthcare programs. In 1933 . . . 37,000 Jews emigrated from Germany. In 1934 . . . another 23,000 Jews fled the country. But during these early years of Nazi control, many Germans, including the Jews, thought that Hitler wouldn’t last long. Not even everyone in his own movement agreed with his policies. The three-million-men-strong, brown-shirted, street-fighting SA Stormtroopers, who’d been instrumental in bringing the Nazis to power, now threatened the party’s power and existence. Hitler’s close friend Ernst Röhm headed the SA. He and the other SA leaders were unhappy with Hitler’s slow implementation of the radical policies the Nazis had advocated from the beginning. Also, Röhm wanted Hitler to combine the Reichswehr, the German military, with the SA and replace the officer corps. The German military leaders fought back by threatening to topple the Nazi regime if the too-powerful SA wasn’t eliminated. Between June 30 and July 2, 1934, and under Hitler’s direction . . .
Heinrich Himmler and the SS arrested the SA leaders and shot them to death, including Hitler's buddy, Ernst Röhm. This operation became known as the "Night of the Long Knives." 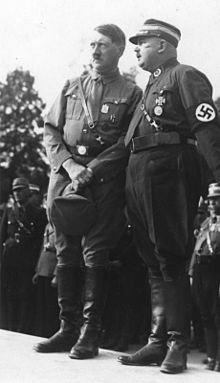 As a result, the German Army leadership formed an alliance with Hitler and supported him when he declared himself Führer on August 19, 1934, less than three weeks after the death of President Hindenburg. Most of these military leaders remained loyal to Hitler for many years to come. In September of 1935, Hitler reduced the Jews to the status of second-class citizens and stripped them of their civil rights. Despite this, many thought the worst was over. Indeed, the Jews felt a sense of calm for two years, and . 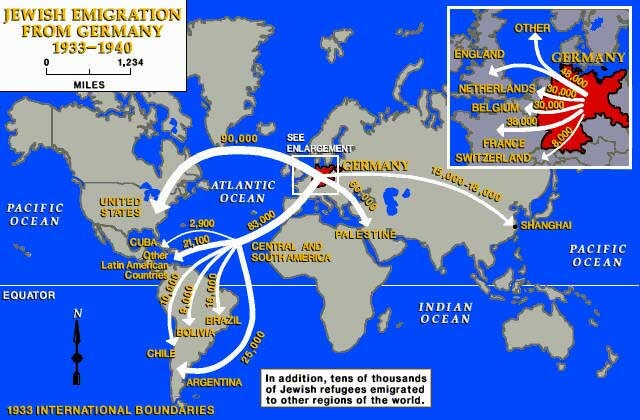 . .
10,000 Jewish emigrants returned to Germany from neighboring countries in 1935. By 1938, Germany had rebounded from the economic instability created by WWI and the Great Depression. Firmly in control of the country, Hitler and his regime set their sights on territorial expansion, and Jewish policies took a radical turn. The German Army occupied Austria in March, 1938. There were 185,000 Jews (3% of the country’s population) living in Austria, and 170,000 of them lived in Vienna (10% of the city’s population). Sixty-two percent of all lawyers in Vienna were Jewish, and a similar percentage held positions in finance and commerce. Almost 50% of all Viennese doctors were Jewish, and Jews dominated trade and were quite visible in cultural enterprises. Before the occupation, the Nazi Party was very active in Austria, promoting the unification of Germany and Austria and stirring up anti-Semitism. After the annexation, anti-Jewish laws were put in place and enforced immediately. The Jews quickly came under attack and were even assaulted in the streets. Jews lost their businesses and their apartments from the start. In August of 1938, SS Lieutenant Adolph Eichmann set up an emigration office in Vienna to help speed the exit of Jews from the country, and . . .
150,000 Jews left during the following eighteen months. The Nazis forced them to give up their property and their wealth before leaving Austria, but the Jews were thankful to be alive. Violence against the Jews increased in Germany and Jewish businessmen were pressured to sell and leave. Jews who had previously immigrated from Poland were sent back; however, the Polish government didn't allow them to return and left them to fend for themselves in the frontier zone. 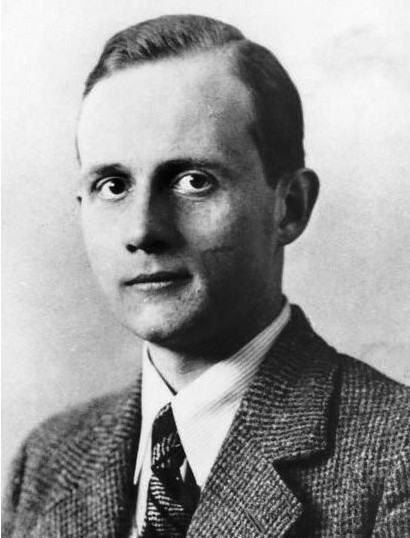 An angry young Jewish man in Paris whose Polish parents resided in the frontier zone retaliated by shooting Ernst vom Rath, a German embassy official at the German Embassy in Paris. 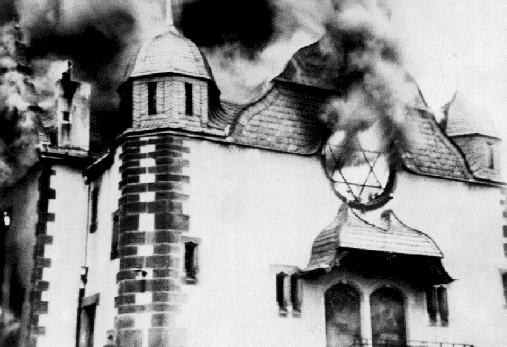 The Nazis used this incident to accelerate Jewish persecution in Germany and Austria. On the nights of November 8-10, 1938, SS and SA men, dressed as ordinary citizens, “set fire to 1000 synagogues, smashed up 7500 Jewish-owned businesses, invaded and ransacked the homes where Jewish people lived, and fatally assaulted over 90 Jewish men. Police herded 30,000 male Jews into concentration camps until they could be ransomed out by their terrified families” (Cesarani). 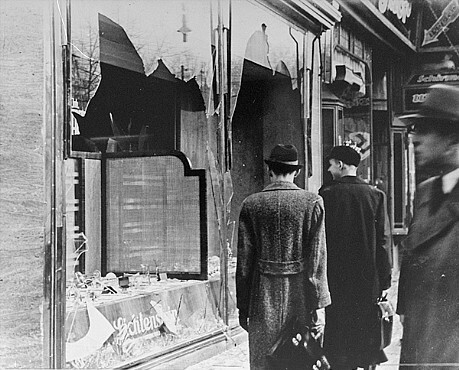 This event became known as Kristallnacht, or "Night of Broken Glass." In addition, the Nazis charged the German Jewish community one billion Reichsmark (approximately 400 million U.S. dollars at that time) for the damage done on Kristallnacht. This spared the German insurance companies from paying. 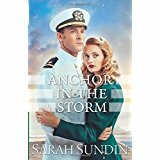 Wikipedia Website - "Kristallnacht," "Ernst vom Rath," "Ernst Röhm"
United States Holocaust Memorial Museum Website - "Kristallnacht"
Giveaway: Leave a comment below by Friday, 3/3, at 8:00 PM (EST) and earn a chance to win Sarah Sundin's WWII book, Anchor in the Storm. Share on Facebook or another favorite social media site and earn an extra chance to win. Don't forget to leave your e-mail address and let me know if you've shared. We attended a class on the history of Israel at a local church last year and it was time well spent. It's amazing how the world still spends so much time and energy on a tiny bit of land that almost disappears on a world map. I'm thankful God doesn't look on things as men do to decide what's significant for His purposes. Thank you for commenting, Stephanie. I loved reading the Zion Chronicles books by Brock and Bodie Thoene because they made the founding of Israel come alive for me. I learned so much! I find myself surprised by the depth of evil and hatred in our world's history. Thankfully we have God to turn to. This was interesting information that I did not know before. Thanks for sharing it and for the giveaway. I've shared this post on Twitter, Facebook, and Pinterest. 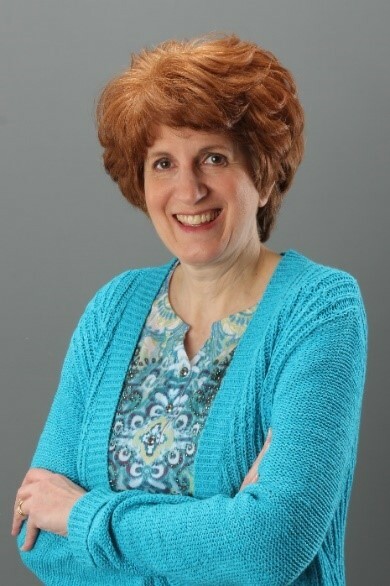 Hi, Loraine. When I learn of evil events from history, I always wonder about the conditions which allowed such acts to take place. I hope we will continue to learn from the mistakes of the past. Thank you for commenting. Thank you, Paula. I love Sarah Sundin too! Amen, Marilyn! Thank you for your comments. Hi, Susan. Next month I'll share stories about the many children rescued from this evil time and place. Stay tuned! It's hard to believe events like this took place not so long ago. I've read the first book in Sarah's series and would love a copy of the 2nd! Hi, Patty. Thank you for sharing. I just noticed that the 3rd book in Sarah's series is out now! Thanks for sharing. It is almost scary to read this all at one time. Thanks also for the giveaway. Thank you for commenting, Betti. Living in Germany during this time period was scary. Thank you to all who participated in the giveaway. And the winner is . . . Loraine Nunley!